In 2009 a remarkable discover was made - a rare breed of Jacob Sheep where found to have a naturally occuring mutation of Tay-Sachs disease!! When a research team is trying to cure a disease like ours - it is most helpful to have a large animal model. In theory - if they can save these sheep it shows promise to save help our kids. The Tay-Sachs Gene Therapy Consortium is lucky to have found a most generous Jacob Sheep ranching community - they have embraced the value of these Tay-Sachs Sheep and are donating thier own time, money and herds to help us breed the sheep so we can work to cure them!! We have ranchers in Texas, West Virginia and Georgia working to breed sheep and raise money for care. The down side is the poor, sick sheep need to know that someone is out there rooting for them to get better - rooting for them to beat Tay-Sachs disease. You could be that person. If we could find the brave sheep a mommy or a daddy - they would try that much harder to get better. We all love to have our mommy and daddy at our side when we are feeling yucky. Can you help a sheep feel better? A sheep parent gets two long sleeve charcoal gray cotton polyester blend t-shirts with neon pink printing and a stress reliever sheep emblazoned with our logo! You can even name your sheep after a Tay-Sachs child. Note: Select Shirt #1 size (adult sizes only) and click the corresponding Add to Cart button. 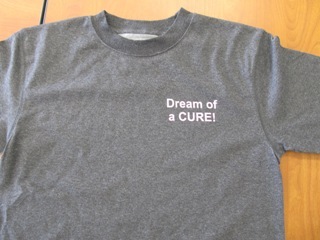 Next, select Shirt #2 size (adult sizes only) and click the corresponding Add to Cart button. 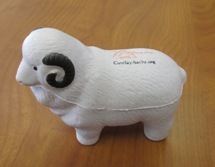 And finally, select the Jacob Sheep Name and click the third Add to Cart button. ON SALE NOW!! 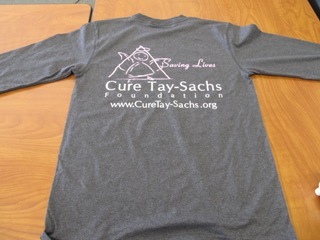 T-shirts are long sleeve cotton polyester blend - great for active people! !